Chemical and Plastic Pollution, and its Counter-measure. Ocean gyres are regions where ocean surface currents, driven by natural wind patterns, circle slowly and converge over a broad region. Some of this surface water descends, leaving behind flotsam that was traveling with the surface water. Over the past century hundreds and hundreds of millions of tons of floating debris (mostly plastic) have been discarded into rivers and oceans worldwide. Much of this plastic drifts for decades in the ocean and eventually becomes trapped in ocean gyres. Therefore, ocean gyres are now littered with what could be trillions upon trillions of pieces of micrometer-scale plastic particles that will never go away, practically speaking, because plastic does not biodegrade. Such photo-degraded plastic is consumed by marine-life and, thus, retains its chemical properties no matter how small the plastic particle becomes. As the plastic can not be digested and is a natural anchor point for toxins, it causes marine-life to either die of starvation when the digestive tract is fatally clogged, or the toxins are incorporated into the bodies of predators. This not only destroys marine habitats, but it also poisons the food chain, where humans ultimately suffer toxic breast milk and cancer (among other ailments) from consuming contaminated fish. The global breadth and severity of persistent environmental pollution is staggering. Much of the plastic trash that is en route to becoming flotsam or that already is flotsam in a marine environment will eventually photo-degrade to very small particles in ocean gyres. The Great North Pacific Garbage Patch is a general region where flotsam including micro-plastics are accumulating. Recent estimates give approximations of 3 - 4 visible floating particles totaling about 5 - 6 milligrams per square meter. Popular media outlets have misrepresented the ocean gyre pollution problem in suggesting that "a floating island of plastic trash" is at the center of the Great Pacific Garbage Patch. A much more realistic description is that there are several debris that are larger than a tennis ball and are tens of meters apart, that the vast majority of plastic mass are particles smaller than bottle caps, and that there might be a total of 20-30 kilograms of plastic million cubic meters (a square kilometer of surface water one meter deep) in the micro-convergence zones where the highest concentration of plastic particles is found. It is known that many toxic, persistent, anthropogenic chemicals including broad families such as polychlorinated biphenyls (PCBs), persistent organic pollutants (POPs), polycyclic aromatic hydrocarbons (PAHs), phthalates, dioxins, furans, halocarbons, and many others, are often characterized as being resistant to rapid decomposition, having lipophilic tendencies, and being semi-volatile. Many of these chemicals are hydrophobic and thus tend to adhere to the surfaces of plastic particles. When small marine organisms ingest the aforementioned plastic particles, POPs and other chemicals accumulate and bio-magnify up the food chain, creating a global health hazard. 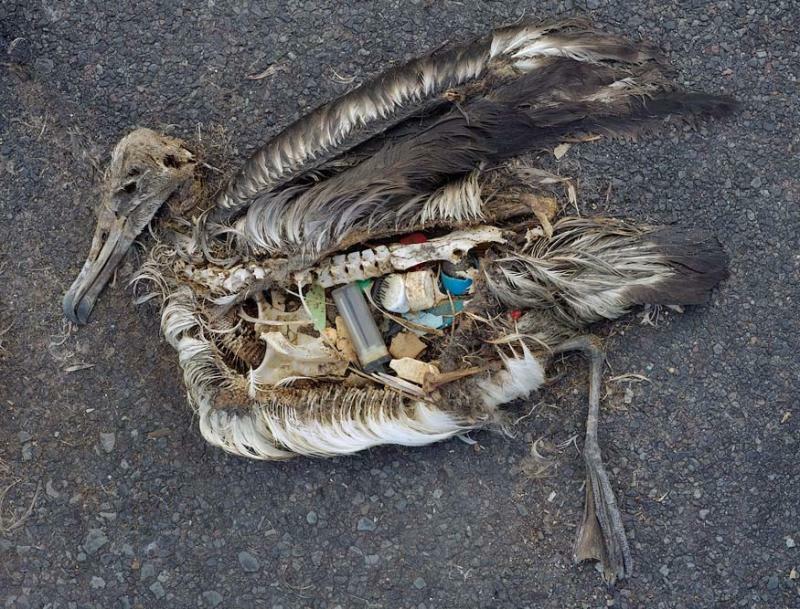 Additional ecological damage occurs when larger pieces of plastic, such as bottle caps and cigarette lighters, are ingested by animals such as birds and turtles resulting in a respiratory and digestive complications or death by associated injuries. Essentially, the many forms of free-floating plastic and chemical pollution, which tend to concentrate in ocean gyres, are hazardous to marine life and humans alike. By capturing floating plastic debris that is the size of a grapefruit and smaller, the Pod not only prevents the material from being consumed by marine-life, but it also permanently sequesters the toxins that can enter the food chain. Therefore, the Pod performs a most critical role of oceanic cleanup and, thus, Abundant Seas Foundation is now seeking strategic partners to launch networks of Pods to the most polluted oceanic bodies, beginning with the North Pacific Gyre. Chemical pollution and plastic micro debris will be collected in floating Pods from ocean gyres and stored within the Pods such that marine life will no longer be exposed to the hazards of these two types of pollution. A high-surface-area fibrous scrubber made of recycled plastic is used to sequester these pollutants. Wave action launches seawater up ramps on the upper periphery of the Pod and then enters the Pod via an orifice on the top of the Pod. Plastics and chemicals are forced against the plastic scrubber within the Pod as seawater descends through the interior of the Pod to exit from an opening at the bottom of the Pod. The design of the Pod, in conjunction with the interior plastic fibers, works as a particle trap for plastic debris and as a zone of surface accumulation for hydrophobic chemicals. 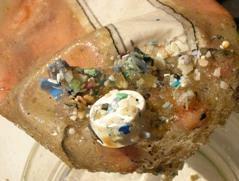 The plastic debris sequestered from the seawater will also serve to adsorb to toxins from the seawater. 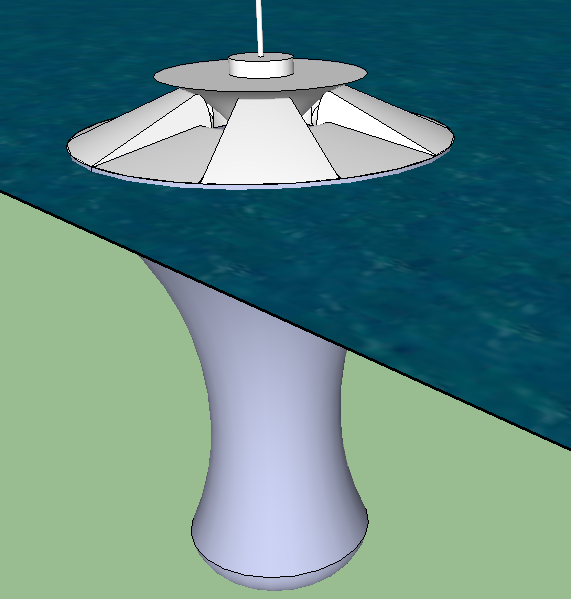 If the Pod were to have one cubic meter of storage space for plastic particles, and if plastics were assumed to have a density similar to that of seawater, a Pod could remove a metric ton of plastic after processing about 33 million cubic meters of surface water in high concentration zones (33 square kilometers of surface water one meter deep). Optional features on the Pod allow for additional benefits including boosting ecosystems and collecting environmental data.